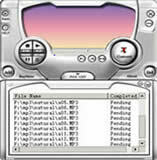 AVOne - All to MP3/WAV Converter is a powerful MP3 and Wave creator from many kinds of windows media files. Media formats include video and audio, including RM RAM RMVB AVI MPEG wma asf and Wave format. You can convert the files to MP3 in batch mode with different Bitrate and sample rate. The converting speed is high. The most important thing is that you can extract your favorite music from long movie and save it as MP3 or Wave. So you can convert RM to MP3/Wave, ram to MP3/Wave, rmvb to MP3/Wave, AVI to MP3/Wave, meg to MP3/Wave, asf to MP3/Wave, WMA to MP3/Wave and Wave to MP3/Wave in batch mode. Batch convert rm to MP3, ram to MP3, rmvb to MP3 and wave. Batch convert avi to MP3, mpeg to MP3, asf to MP3 and wave. Batch convert wma to MP3 and Wave to MP3 and Wave. Select different bit rate and sample rate for exported MP3 (Bitrate: 32k, 40k, 48k, 56k, 64k, 80k, 96k, 112k, 128k, 160k, 192k, 224k, 256k and 320k bps. sample: 48HHz, 44KHz and 32KHz), for exporting wave format, you can select from 8K to 48K as sample rate. Click Add button, you can multiselect files in open files dialog-box with or key. You can remove the files in listbox only click Del button. Click Option button to setup some format, Bitrate, sample rate, channel, and destination exported folder for MP3/Wave file. Click Start to Convert button to batch convert all file in listbox to MP3/Wave. Note:To every media source file, you can set start time and end time to extract music from long media (video)file. is a powerful tool for video file conversion. Mobile Ringtone Converter can Convert / Record / Mix audio to Moblie Ringtone format as MP3, OGG, AMR, MMF ,AMRWB, WAV..
converts audio format MP3, WAV ( PCM, DSP, GSM, ADPCM ), WMA, MP2, OGG from one format to another. It is designed for use with all types of phone, add new ringtones to your mobile or cellular phone. is a super software tool for converting RM/RAM/RMVB to AVI DVD VCD SVCD MPEG1 MPEG2 in batch mode.